If oily and acne-prone skin is your key concern, you would have definitely heard of tea tree oil. Coming all the way from tea trees in Australia, the oil has a reputation as a skincare superhero. Tea tree oil is known for its antibacterial properties which helps treats acne and purify the pores. To add tea tree oil to your beauty routine in the best (and easiest) way possible, take a look at our list of 5 tea tree oil-enriched products that might be of service. Foremost, the famed tea tree oil itself from The Body Shop’s equally famous tea tree oil skincare range. The potent oil is incredibly versatile and can be used in DIY remedies, facial steams or even as a spot application. It is known to work especially well on pimples – do ensure that you do a patch test before using it. 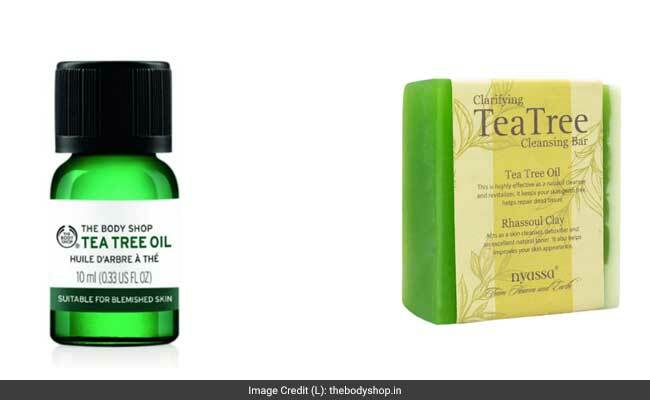 The Body Shop Tea Tree Oil is available for INR 645 at The Body Shop. Imagine, for a second, the amount of oil and dirt your skin accumulates during the day. A tea tree-based cleanser can really get out the gunk. This cleansing gel from Oriflame promises to remove all kinds of impurities (even makeup!) without leaving your skin excessively dry. Oriflame Love Nature Tea Tree Cleansing Gel is available for INR 355 at Oriflame India. Now this is a moisturiser like never seen before. Its formula is enriched with tea tree oil amongst a few other hero ingredients, whose antifungal properties are ideal for monsoon days. It is created for multiple uses like moisturising the body, as an after-shave lotion and even as a leave-in conditioner. Paul Mitchell Tea Tree Hair And Body Moisturiser is available from approximately INR 3000 at leading salons across India. Another wonderful way to make use of tea tree oil for the skin is with a cleansing soap like Nyassa’s handmade bar. Along with purifying skin from deep within, the tea tree oil also aims to soothe tired skin. Who would have thought a simple bar of soap could do this much. Nyassa Clarifying Tea Tree Cleansing Bar is available for INR 350 at Nyassa Bath And Body. One of the most popular uses of tea tree oil is in a detoxifying face mask. Rather than mixing it yourself, a sheet mask like this from Innisfree works quicker. It promises to purify the skin and keep it clear. All of that, even when you’ve only got 20 minutes on hand. Innisfree My Real Squeeze Tea Tree Mask is available for INR 100 at Nykaa. Now go ahead and give tea tree oil a try for the benefit of your skin.